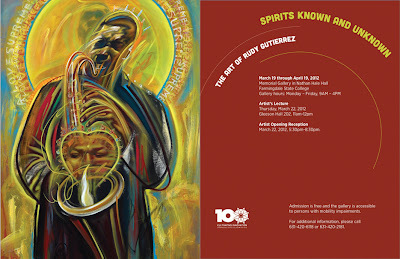 Rudy Gutierrez is going to have a free exhibit at the Memorial Gallery, Farmingdale State College. 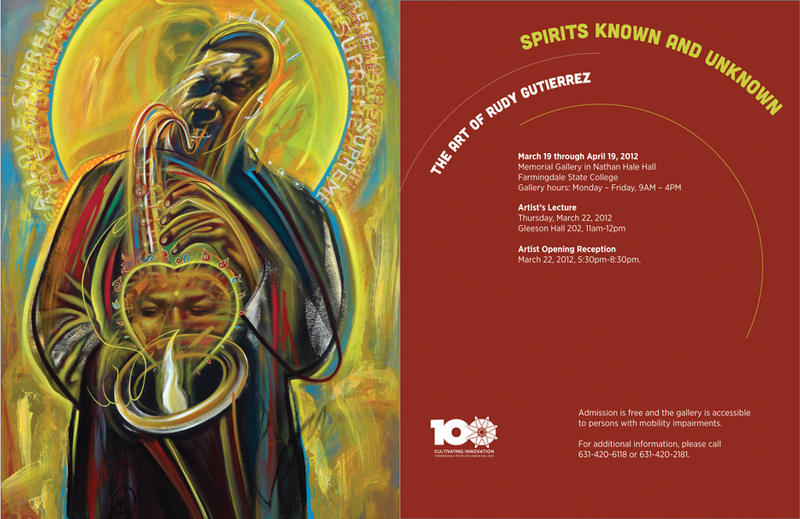 The artist will give a lecture on Thursday, March 22, 2012 from 11 a.m. until noon in Gleeson Hall 202, and the artist's reception will be held on the same day from 5:30 to 8:30 p.m. in the Memorial Gallery in Hale Hall. Gutierrez blends "the visual parallels of the African and the Indian with an Urban and world musical sensibility" in his paintings. He seeks to inspire viewers with a sense of their own divinity. The artist is a graduate of Pratt Institute, and his work has appeared in a wide range of periodicals, books covers, children's books and more. He has exhibited internationally including at the World Conference Against Racism in South Africa and performed as a guest artist with Def Dance Jam Workshop doing live "painting performances" with the company that features hearing impaired and physically challenged kids. He has also "performed" with Dance, Music, and Kids on stage with performers of the Broadway shows "The Lion King" and "Bring in the Noise, Bring in the Funk."